The Southern Oregon offense erupted for 30 points in the first 10 minutes of the second half as the Raiders turned a two-point halftime advantage into a 20-point second-half lead as the Raiders defeated Northwest 87-70 in Cascade Collegiate Conference women’s basketball action Friday night at Bob Riehm Arena. 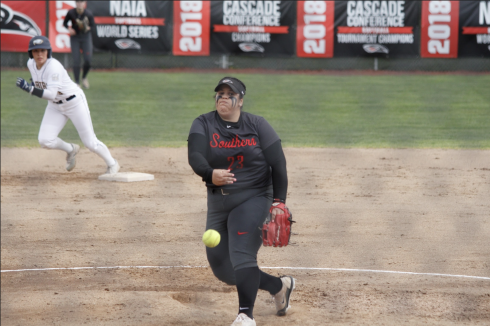 Southern Oregon improves to 14-12 overall and 4-11 in conference play, while Northwest falls to 10-14 overall and 6-10 in the CCC. Both teams return to action tomorrow night, as the Raiders host Evergreen in the final home game of the regular season and Northwest travels to Klamath Falls for a 5:30 p.m. matchup with Oregon Tech. Angelica Cahee posted a double-double with 19 points and 10 rebounds, making seven of her 10 shot attempts in the game. She also added a team-high five rebounds and three steals for the Raiders. Molly Doran tied for the team-lead with 19 points as she shot 6-of-10 from beyond the arc. Krysten Copeland tallied 11 points and Cassandra Tiggett added 10. Jessalyn Jackson scored a game-high 24 points, including 10-of-11 shooting from the free throw line. She added eight rebounds and four steals before fouling out with two minutes to play. Emily Drivstuen finished with 15 points and Ebany Herd scored 14. The first half featured three tie scores and nine lead changes, with SOU’s 24-18 lead marking the largest advantage of the period. Northwest responded with a 10-3 run to take a 28-27 lead following a pair of Carol Howard free throws with 3:11 to play in the half. 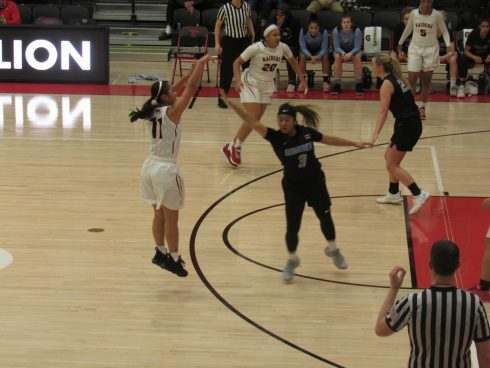 Nalani Hernandez hit a jumper and Doran sank a trey to put SOU up by four, but Drivstuen responded with a three-pointer and Jackson made a layup to give Northwest the 33-32 lead in the final minute of the half. The Raiders claimed a 35-33 lead at the break after Gigi Glogovac converted a three-point play to put SOU back on top for good. Southern Oregon scored 15 points in the first three minutes of the second half as the Raiders made their first six shot attempts of the period. Doran made a trio of three-pointers as the Raiders pulled ahead by double-figures. A Tigget three-point play gave their first 20-point advantage with 10:29 remaining, and the SOU lead hovered around that point the rest of the way. The teams combined for 51 fouls and five players fouled out of the game. Southern Oregon out-rebounded Northwest 56-42 and finished with six blocks to the Eagles’ one. The Raiders limited Northwest to 28 percent shooting (21-of-75), while SOU’s 46.8 percent shooting percentage (29-of-62) marked its best performance since the Raiders made 50.8 percent in a November win over Warner.